A solar flare is a sudden brightening observed over the Sun surface or the solar limb, which is interpreted as a large energy release of up to 6 × 1025 joules of energy. The flare ejects clouds of electrons, ions, and atoms through the corona into space. These clouds typically reach Earth a day or two after the event. 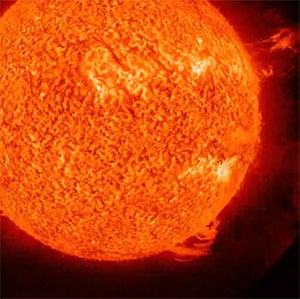 Solar flares affect all layers of the solar atmosphere (photosphere, chromosphere, and corona), when the medium plasma is heated to tens of millions of kelvins and electrons, protons, and heavier ions are accelerated to near the speed of light. They produce radiation across the electromagnetic spectrum at all wavelengths, from radio waves to gamma rays, although most of the energy goes to frequencies outside the visual range and for this reason the majority of the flares are not visible to the naked eye and must be observed with special instruments. Flares occur in active regions around sunspots, where intense magnetic fields penetrate the photosphere to link the corona to the solar interior. Flares are powered by the sudden (timescales of minutes to tens of minutes) release of magnetic energy stored in the corona. X-rays and UV radiation emitted by solar flares can affect Earth’s ionosphere and disrupt long-range radio communications. Direct radio emission at decimetric wavelengths may disturb operation of radars and other devices operating at these frequencies. The frequency of occurrence of solar flares varies, from several per day when the Sun is particularly “active” to less than one every week when the Sun is “quiet”, following the 11-year cycle (the solar cycle). Large flares are less frequent than smaller ones.